Mrs. Emiko Tabata passed away on January 14, 2009 at the age of 83. 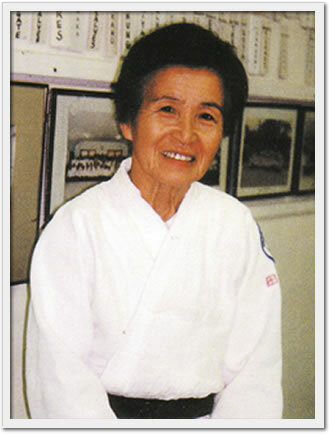 She was a 6th Dan black belt instructor for the Honolulu Ki Society, Seishinkan Dojo, where she unselfishly devoted her time and effort teaching children and adults Ki and Aikido for over 50 years. Along side her husband of more than 60 years, Seichi Tabata Sensei, Chief instructor for the Honolulu Ki Society, she would teach 50 to 100 students in a single class. Over the years she became one of the key figures in the establishment and growth of the children's program at the Seishinkan Dojo. Mrs. Tabata had a wonderful way with children. Always laughing and smiling while teaching, it was obvious the children loved training with her. She had a joyful way of teaching the arts which made it both enjoyable and meaningful. Mrs. Tabata always filled the dojo with cheerfulness and plus ki. She was always thankful to us all and encouraged everyone to do their best for the dojo and others. Mrs. Tabata was well respected and admired as she was always doing for others without a thought for herself. She was an inspiring instructor as well as a nurturing mother and grandmother. One of many special things Mrs. Tabata did for others was to sew a wonderful bag for our hakama as a gift of appreciation for every student who passed their Shodan or first black belt test. It was a wonderful gift of love we will always cherish. Her Aikido was awesome to watch and her ki tremendous. In her mid 70's she could beat a male instructor nearly half her age in arm wrestling. A testament to her inner strength and positive ki that she applied to everything she did in life. Throughout her lifetime, she was a source of strength and inspiration for countless people. She will be deeply missed by the dojo. In her loving memory, the Seishinkan Dojo will continue to develop and help others with the same cheerfulness, strength and unselfish devotion that Mrs. Tabata exhibited throughout her life.